This modification of Note Block Studio has been approved by Stuffbydavid, the original developer. You can download Note Block Studio HERE. A Note Block Composing tool for experienced users. Numerous changes have been made to increase the limits of Note Block Studio. From songs being faster than 20TPS, a larger workspace, and relevancy to modifications. This is based on Note Block Studio v3.3.0 and is coded with GameMaker: Studio. It has a dark theme! More shapes! Bugfixes! An improved UI! 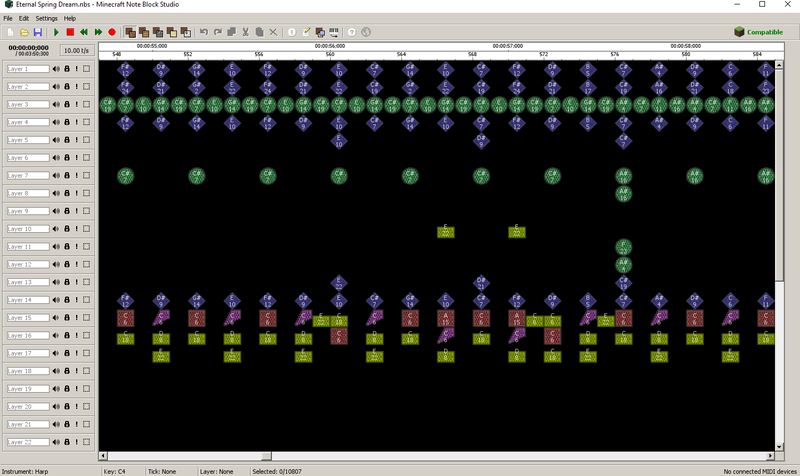 All of the notes in the original MIDI are imported and placed as note blocks. The preference setting defaults have been tweaked to make MIDI importing a bit more accurate. Issues of MIDI Import crashing have now lessened, and ALL pitch values are set to +1. Extra custom instruments and improved sounds. a Trumpet, a Sawtooth and the Willheim Scream. All the sounds are royalty free. such as High Harp, Low Harp, High Pling and High Double Bass. The main instruments have an extra reverb effect added. HOWEVER, there is a BIG DISCLAIMER. This program may have BUGS. 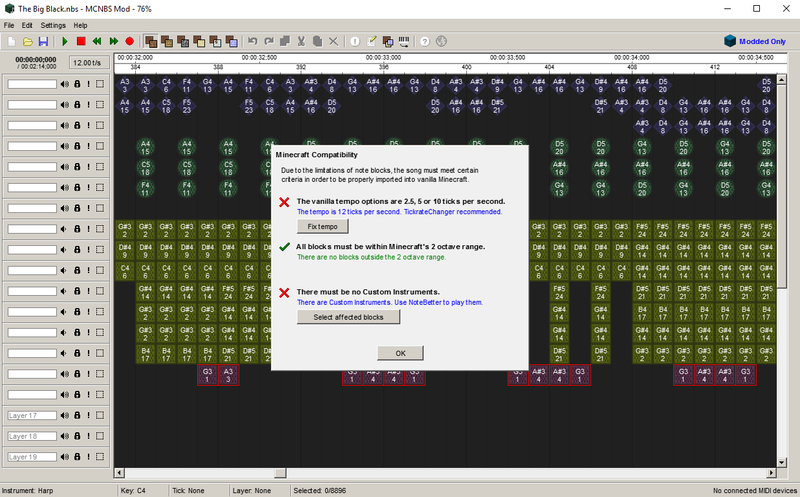 If you are afraid of bugs, or have had no experience creating note block songs, this program is not for you. Please use vanilla Note Block Studio instead. If you are fine with random crashes, and BAD PROGRAMMING, then continue. Like Note Block Studio, this is Windows only. To run this on a mac please use a Virtual Machine or Bootcamp. A mac port will not happen as it takes C++ and Game Maker: Studio knowledge to reprogram .dll plugins in this program into .dylib files for mac use. http://enbyex.github.io - SoniEx2's tools. Has NoteBetter, a forge coremod that imports custom instruments into the game. https://www.youtube.com/user/ShinkoNet/ - My YouTube channel, filled with examples of songs made with NBS Mod. If you make any songs using this program, feel free to post them so I can list them here! Here is a playlist of 150+ songs I have made using this program. 1. Where's the piano roll? The piano roll can be accessed by pressing the "down" key on your keyboard. 2. How do I get the dark theme? Go into the preferences window and change the theme to "Recording Mode". A hotkey to switch from normal mode to recording mode is "Ctrl+T" for normal mode, "Ctrl+G" for recording/dark mode. 3. Why is it laggy? CTRL+A > Right Click > Expand Selection > Double the TPS Speed. When exporting into a schematic file, revert it by compressing the selection and halving the TPS speed. 4. Why did it just crash? What happened to my work?! I have no idea why it crashed, and I probably won't be able to help you. Please just save your work often. 5. How can I make music when the notes get placed behind the piano roll? Use a MIDI keyboard or import instead. 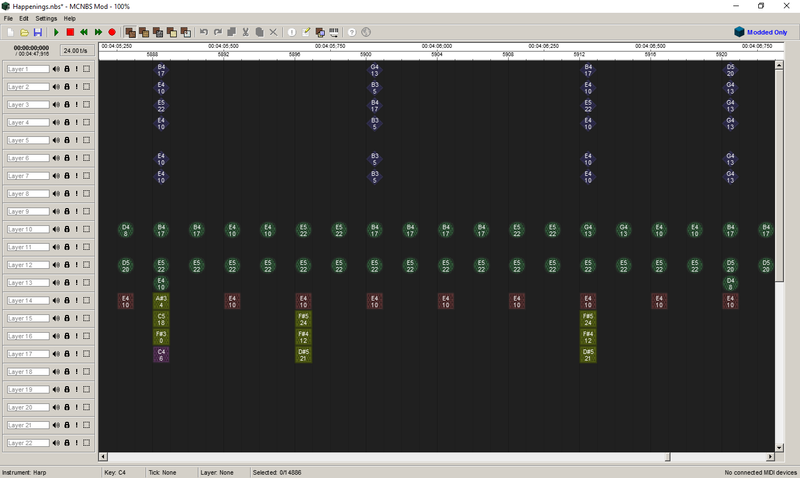 This edit was originally designed for my methods of creating a note block song, which included sequencing a MIDI by ear, transposing it into a Note Block Compatible MIDI, then importing it. I then use it primarily for showcasing my songs. Or, you could just delete the blocks once you finish composing your song. Up to you. 6. What about all the other questions? Check the main FAQ over on Stuffbydavid's thread, mentioned at the top of the post. You might find your answer there. 7. Why does Chrome say the download is a virus? I assure you that it isn't a virus. For some reason, using 7Zip or WinRAR on this stuff makes some browsers alert a virus. It's a false positive, feel free to scan it with your own antivirus software or decompile it. Update! Here's MCNBS Mod 1.4. >Ported to Note Block Studio 3.3.0! >Opacity changing removed due to lag. >Notes easier to place as the columns are more visible. >Sound is now pitched more accurately to ingame note blocks. >90s theme has been replaced with Recording mode. Go into the settings to change to the "black" theme. >Recording mode optimized for Luma Keying, with a plain black background. >Bugs: Tabs are black in Recording Mode. (It's just for recording.) and they close VERY FAST so you need to click very quickly. Same with the TPS slider - it gets stuck now. >Tick by Tick no longer places the marker in the centre of the stage, but near the right of it. I left v1.3.2 up because there are some compatibility issues with Note Block Studio 3.3.0, so if you're on an older Intel HD Graphics card you should use that. Edit: Added hotfix 1.4.01 to give a toggle between Normal Mode and Recording Mode (Ctrl+T and Ctrl+G). Also some shameless self-promotion added. The menu items (File, Edit, etc.) open and close instantly most of the time; rarely does it manage to stay open. The minimise button does not work; the window size does not change, only the title bar objects get aligned too far up and get slightly cut off the screen. They are properly aligned when I move the window away from the maximised position. The numbers below the timestamps should be able to also represent measure number, not only beat number. Add an option to toggle the visibility of the piano roll rather than having to hold down a key. Toggle between displaying sharps or flats. I'll see what I can do about the piano roll visibility. EDIT: All fixed for next version! Piano will be theme-dependant and I made a toggle for the roomspeed. 1.4: Runtime Error when I try to run it on Windows 10. It doesn't even get to the main window. 1.5 preview: It loads, but spits out a bunch of errors about not being able to load various .ogg files. When I try to load a pre-made song, it crashes again, with the same Runtime Error. It doesn't give me any more details than that. Have you run the installer and tried again? Did you place the files in the zip into a non-temporary folder? If it doesn't work, try using NBS Mod 1.3.2 (all of the crashes are from the official Note Block Studio's latest version, so using the version with the older version of the original as a base might work). I have a suggestion, since I know the original creator hasn't really had the intention to do it, could you possibly add in a noteblock to command block conversion option, or even better, make a command block song making mode? I feel that would be a wonderful idea, and it would bring so many better features than what regular note blocks can do. Unless it's already in the works? When will 1.12 sounds be added? Near as I can tell, half of the links lead to programs that no longer work. Most of them throw errors on startup.